Christmas has come early for all the lucky winners of 2015's Spanish Christmas Lottery. With a total prize pool of £1.6 billion it's the world's biggest and most generous lottery. One lucky Lottoland player knows this first-hand, having won the €4 million (just under £3 million) El Gordo prize betting with us! The biggest lottery event of the year has come to an end and once again it's been a huge event for Lottoland too. We're proud to announce that one of our players from Germany scooped the grand prize, El Gordo, with the winning numbers 79140. One of our players has just received a Spanish lesson he will never forget. 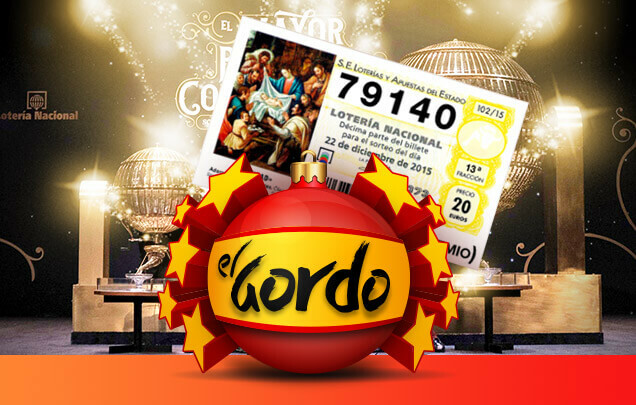 In Spanish “El Gordo” means “the fat one” and, in lottery terms, that means the grand prize. The grand prize of the Spanish Christmas Lottery is worth a massive €4 million, which comes in at just under £3 million. Can you think of a nicer present to receive just days before Christmas? At the time of writing – the evening of December 22nd – Lottoland is still hard at work messaging our winners. And, just like last year, we're certain to have plenty more players who, in the pre-holiday rush, have yet to be surprised by their pre-Christmas windfalls. Our winner, who wishes to remain anonymous, learned about Lottoland while searching for a way to enter El Gordo online. He'd heard about being able to bet on the results online from an aquaintance who had profited from playing in the past, and so was eager to try it out for himself. Our winner wasted no time in recruiting others and, together with his wife and three others, formed a mini syndicate of five to purchase a full Spanish Christmas Lottery betslip. Each player selected one lucky number each, to make the full betslip line. Meanwhile everyone else was still at work, so he had to wait until he could share in the excitement. He's planning a somewhat subdued celebration later this evening. ”Nothing too dramatic”, he says, as they're all still not sure what to do with their big win. When asked specifically if he had any plans he mentioned that he was mulling a holiday, but again, in true German style, not without careful deliberation. Of course traditional Prussian prudence gets swiftly tossed aside as soon motoring is mentioned. As a native of Wolfsburg, the home of Volkswagen, we asked whether he was considering upgrading das auto to something a little flashier in the new year. But, as it turns out, our newest winner prefers two wheels to four, more specifically touring bikes and a boyish tone creeps into his voice while discussing the prospect of buying his BMW dream bike. Good advice, and it's the reason why the motorbike lover, alongside truck driver Adam, is one of Lottoland's biggest winners of the year! Now Everyone Can Win El Gordo! The Spanish Christmas Lottery, or Sorteo Extraordinario de Navidad, is the world’s biggest lottery. This year it offered a prize pool of £1.6 billion. Until quite recently all we could do is watch in envy, as news of huge wins made headlines worldwide. Now, thanks to Lottoland, players from the UK, and all across Europe, can bet on the results online and win huge prizes too! Lucky Lottoland Player Wins El Gordo!